Meet the top money managers, endowment chiefs, pension heads and other institutional investors in our second annual U.S. Investment Management Awards. Andrew Stephens, head of Artisan Partners growth team and lead portfolio manager of the Milwaukee firms midcap growth equity product, thinks of himself as a farmer  of stocks, that is. With 20 percent of his best ideas responsible for 80 percent of returns, Stephens has implemented a finely tuned system at Artisan to cultivate top-­performing portfolios. His folksy, but effective, method involves a garden, a crop and a harvest. Stephens plants companies that have defensible brands, low-cost structures, dominant market shares and proprietary assets  and that are early in their profit cycles. As the profit cycle takes hold for one of its seedlings, Artisan rapidly adds to its position. At harvest time it sells companies that are at full valuation and nearing completion of their profit cycles. Most days, Stephens is pulling in a flush crop for Artisan, which oversees $62.7 billion in assets. He says that changes in the markets and a hypercompetitive industry where an increasing number of mediocre managers have been forced out make doing that harder. Artisan, whose name fittingly evokes craftsmanship, is the Midcap Equity Manager of the Year in Institutional Investors second annual U.S. Investment Management Awards, which recognize U.S. money managers across 23 asset classes, strategies and product types that stood out in the eyes of the investor community for their exceptional performance, risk management and customer service. The manager winners were selected through a painstaking process. We began by analyzing data in more than two dozen strategies and sectors, looking at 2010 returns as well as asset size, three-year annualized returns, standard deviations, and Sharpe and Sortino ratios. (The majority of the data were supplied by White Plains, New Yorkbased Informa Investment Solutions.) From that review we culled a list of the top firms in each strategy and sector for a questionnaire that we sent to more than 1,000 endowments, foundations, pension funds and other institutions, asking them to pick the top three managers in each of the categories. We used the results of that survey to tabulate the winners presented here. The U.S. Investment Management Awards also recognize the best fiduciaries among small and large public and corporate pension plans, endowments and foundations. 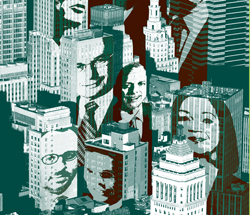 IIs editorial staff independently researched investors to identify eight individuals who not only excelled in 2010 when it came to the performance of their portfolios, but also displayed innovative thinking, broad market knowledge and investment leadership. Today neither the manager nor the investor winners have the luxury of resting on their laurels. With asset management at the apex of competitiveness, money managers are battling against one another for new business from investors still shell-­shocked from the financial crisis and from baby boomers preparing for retirement. Its no longer enough to be able to choose the best securities. Managers also need operational and compliance skills to succeed. In addition, they must be proactive and get involved in industry issues; understand environmental, social responsibility and corporate governance (ESG) factors; see investing through a global lens; rely on their own credit research; and be able to provide clients with advice. For their part, investors want sound infrastructure, operations, compliance and risk management capabilities. Pension funds, for instance, are looking for a better way to track the costs of foreign exchange transactions, which have become increasingly important as their portfolios have become more global. During the past year some pension funds have been caught paying too much for the privilege of converting currencies through certain custodian banks. Money managers will have to wrestle with what risk-­adjusted investments will be in demand by the market, adds Mario Gabelli, chairman and CEO of $32.5 billion-in-­assets Gamco Investors in Rye, New York, and IIs Money Manager of the Year. This is particularly true, he says, given his expectation that annual equity returns over the next five to ten years will be in the single digits. Before investing these days, clients are researching firms ability to invest in expensive systems to run risk models, track the impact of new regulations, stop suspicious or unusual trades before they are executed and provide reporting tools on all the new data. Keeping up with the latest technology and hiring staff to oversee and manage these systems is no small task. Myra Drucker, former CIO of Xerox Corp. and IIs Investor Lifetime Achievement Award winner (page 49), says investors arent taking money managers at their word that everything is safe and sound. There is a level of due diligence that goes into assuring that what the investment manager says exists really exists, she explains. Money managers are starting to realize that they cant do it all themselves. Some are turning to third parties such as global custodians to provide risk management systems and reporting tools on an outsourced basis  a big boon to that industry. Others are selling stakes of themselves to larger entities like Principal Financial Group and Affiliated Managers Group, which can then spread these costs over a larger asset base. Lazard itself benefited from net inflows between 2006 and 2010 in part because it has been able to maintain the mentality of a boutique with the global footprint and infrastructure of a much bigger firm. Lazard Asset Management has offices in 13 countries. Some managers see the new requirements as an opportunity. Robert Turner, co-founder of Berwyn, Pennsylvaniabased Turner Investment Partners, has experienced the desire for increased back-­office capabilities, as well. But he sees the rise in compliance costs, for instance, as a plus. That creates a barrier to entry, says Turner, whose firm has $18.6 billion in assets under management and is the Growth Equity Manager of the Year. Investors are also demanding greater transparency. During the financial crisis they often found themselves knowing shockingly little about certain investments and the illiquidity associated with them. Private equity firms continued to call capital from investors and shut off distributions, and they did not provide current valuations on portfolio companies. Now many investors want to know more about their private equity positions and want the information more frequently, even in real time. Private equity firms in turn are hiring others to provide these capabilities, acknowledging that though they may be great investors, they are not sufficiently experienced in handling back-­office procedures. Investors are increasingly using ETFs to implement sophisticated trading strategies. That move has powered $3.65 trillion BlackRock, which purchased Barclays Global Investors in 2009, including its iShares ETF lineup, to win a second straight Exchange-Traded Funds Manager of the Year Award. Liz Tennican, managing director of iShares, says ­BlackRocks popularity in the ETF market is partly fueled by the deep liquidity it provides in the funds. 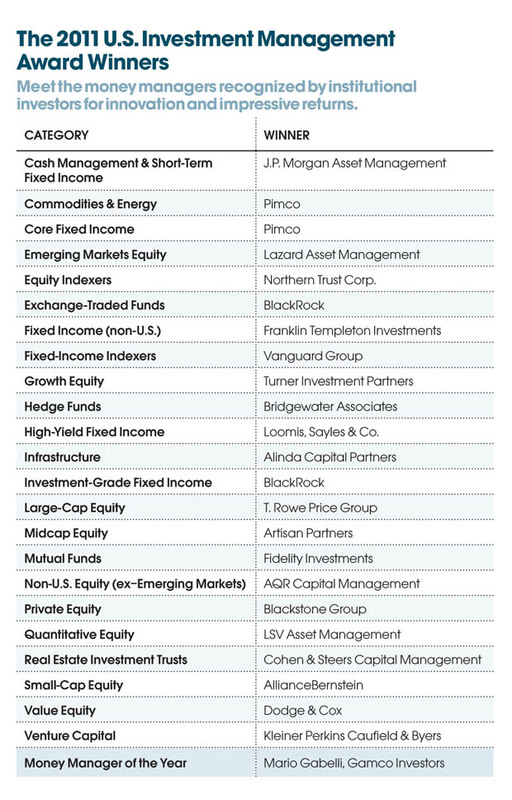 ­BlackRock has relationships with 40 broker-­dealers that can create and redeem shares of its more than 220 iShares listed in the U.S. Tennican says investors are using ETFs to create a liquidity layer in their portfolios. For instance, when an investor puts part of its large-cap equity allocation into ETFs, it has the ability to easily raise cash  by selling ETFs  without deviating dramatically from its overall asset-allocation and portfolio policy. Passive investing is not all about equities, even for the firm that invented the index mutual fund. Gregory Davis, head of the bond indexing team at Valley Forge, Pennsylvaniabased Vanguard Group, the top manager in the Fixed-­Income Indexers category, says the advantages of indexing are even more clear-cut for a bond portfolio than for equities. Fees end up eating so much of the potential return that indexing in fixed income is compelling, he says. Exchange-traded funds also have been a big winner for $1.6 trillion-in-assets Vanguard, which brought in close to $7 billion in the ETF share class of its bond funds last year. Over the past decade money managers have been increasingly looking at ESG issues before investing. Industry insiders say that requests for proposals  the documents that pension funds and other institutions send to money managers detailing their requirements  are devoting far more space to ESG factors, especially corporate governance. Lazards Reinsberg points to catastrophic problems at Japans Fukushima Daiichi nuclear plant in the wake of this years earthquake and tsunami as a low point. Investors want to know how they could have been protected, he says. Managers are also taking leadership roles in the industries in which theyre active. Take New Yorkbased Cohen & Steers Capital Management, which has $34.5 billion in assets and is Real Estate Investment Trusts Manager of the Year. Investors credit Cohen & Steers with deftly navigating the financial crisis and knowing when to jump back into the markets at the lows. Even so, as a leader in REITs, the firm has been much more active in governance issues since the crisis, including lobbying for changes in capital-­raising rules in the U.K. The manager argues that requiring U.K. companies to go to existing shareholders before raising outside capital is an antiquated practice that makes the whole process more expensive. People have told us not to bother, that things wont change, says Cohen & Steers president and CIO Joseph Harvey. But companies are listening to us. The firm, which has gained assets as institutions increasingly have turned from private real estate to REITs, has also become more involved in property rights and governance in emerging markets. Institutional investors have come to rely on the deep expertise of a few stalwarts who have navigated multiple credit cycles. They are closely watching William Gross, co-founder and co-CIO of Newport Beach, Californiabased, $1.2 trillion-in-­assets Pacific Investment Management Co., the top manager in the Core Fixed Income and Commodities & Energy categories. Gross has sold most of the Pimco Total Return Funds Treasuries because he anticipates significant inflation as a result of the Federal Reserves moves to lower interest rates and the U.S.s inability to deal with the national debt. The best investors are spending huge amounts of time and money establishing beachheads in far-flung markets. Investors dont want managers to analyze Asian securities from London or San Francisco anymore. As an example, Lazard has offices in Bahrain, Seoul and Sydney, among its many locales. Demographics are having a big impact on money managers. The baby boom generation reshaped music and the American suburban landscape. Now its reshaping asset management. With Americas largest generation beginning to embark on retirement and having witnessed three bear markets, investors are finally ready for some advice. Many are looking for guidance from the providers of mutual funds with which they are already familiar through their defined contribution plans. Fidelity Investments, Mutual Funds Manager of the Year, has seen dramatic growth in its asset ­allocation products, including both funds and managed accounts. 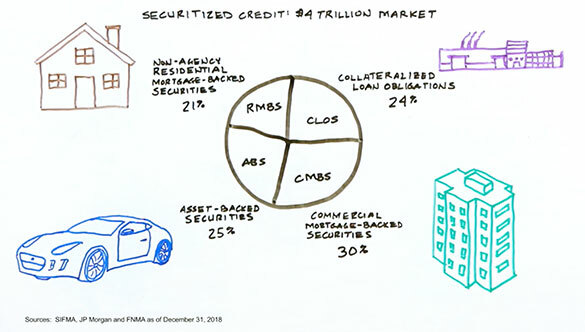 At the end of 2007, Fidelity had $230 billion in these products. Now it has $350 billion. Whats more, investors have been patient. The Boston-­based manager, which oversees $1.6 trillion in assets in total, has experienced outflows in these products during only one quarter, the final three months of 2008, when the world looked like it was coming to an end. Boyce Greer, head of institutional investments and global asset allocation for Fidelitys asset management division, says the firm started developing managed products as it witnessed what he calls the institutionalization of retail clients  meaning sponsors and others were making decisions for individuals in one way or another. A retail sale was similar to one made to an institution, with demands for information on esoterica like Sharpe ratios. Greer says the financial crisis accelerated the move to advice after investors pulled money out of equity funds and moved to cash at just the wrong time. Vanguard, the poster child for self-­directed investors attracted to its low-cost index funds, has also been a beneficiary of the move to advice-­based investing. It now has an ETF share class of many of its biggest funds. The ETFs are hugely popular with advisers at the major brokerage firms, most of whom would never have sold a no-load mutual fund. People who want advisers now can reach them through our ETFs, says bond indexing chief Davis.